Love the features and its dependability. My vehicle runs very well. It has just over 113, 000 miles and has not given me many problems. I have always kept up on the maintenance and get a yearly inspection and I haven't had any issue. I had to replace the alternator but being 17 years old that is to be expected. I love my leather interior and the ls model I own is all electric, windows, doors, seats, etc.. I would refer this vehicle's manufacturer to anyone. Chevrolet makes a strong, dependable and long lasting line or cars and trucks. I am lucky to have one of the impalas from the early 2000's and I'll drive it until it will not go anymore. Selling it has never crossed my mind. 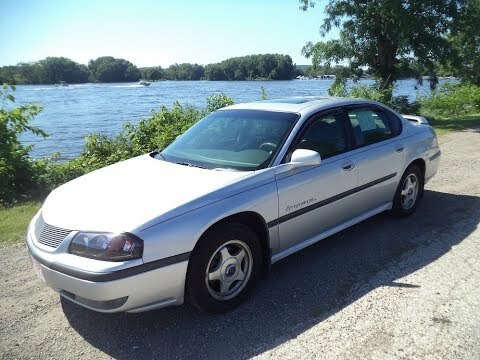 The 2001 Impala is simply amazing car. I drive a 2001 Impala I think purchasing this car new would be a better option for a buyer. This car is wonderful and drives smooth but cosmetics tear real easy radio light switches etc. I'd recommend this vehicle though all in all its good. I also want to add that the factory amps quickly quit working forcing you to run new speaker wire to existing speakers to bypass the factory amp. Performance issue remains unfixed on later model Impalas. Reliability has been sketchy because of a sensor problem that took too many trips to properly diagnose. Same problem encountered thus far on our 2015 Impala. The car is VERY comfortable. It has a sunroof which we have enjoyed. We also like the built-in OnStar features, although we do not subscribe. The car has stood up to quite a bit of use over the years. On certain passenger vehicles, the air bag sensing and diagnostic modules (SDM) could experience a memory error resulting in the air bags not deploying in a crash situation. In a crash, a front seat occupant may receive more serious injuries. Dealers will replace the sensing and diagnostic module. The manufacturer has reported that owner notification was to begin during September 2000. Owners who do not receive the free remedy within a reasonable time should contact Chevrolet at 1-800-222-1020.